When I realized how many Civil War ancestors were perched in my family tree, I was curious about where they served, the battles they saw, and what daily life must have been like for them in an Army encampment. My curiosity took me on a journey for two of those ancestors, Mike Keller of the 27th Indiana and James Knox of the 18th Missouri. Although I didn't find photos of the men, themselves, I did find pictures of the roads they marched, the equipment they used and the horrors they witnessed. My biggest surprise was that they survived the war at all; Keller and Knox fought in some of the bloodiest battles of the war, including Antietam and Shiloh, each with 23,000 casualties, and Gettysburg, with 51,000 casualties. Of the three million Americans who fought in the Civil War, more than 600,000 never came home. The first thing to do is to go to Google (or your favorite search engine) and type in the name of your ancestor's regiment . Also, don't forget to add the branch, i.e. infantry, cavalry, artillery, or engineers. Your search will bring up regimental histories, including the names of the battles and where the regiment was stationed on a specific battlefield, i.e. Bloody Lane at Antietam, or the Peach Orchard at Shiloh. If you think your ancestor's regiment was at a major battle but can't find proof of that, do a search for "order of battle" plus the name of the battle. The order of battle is a list of all of the divisions involved in a battle, divided by brigade and then by regiment - in other words a complete list of every unit involved. From my search, I discovered that Mike Keller's regiment was on the north side of the cornfield at Antietam, while Knox's 18th Missouri camped near Shiloh's Eastern Corinth Road, 0.2 miles south of Peabody Road. Now I can search for photos. Armed with the name of your soldier's regiment and the branch in which he served, head over to the American Memory collection at the Library of Congress. Navigate to the Selected Civil War Photographs from the Matthew Brady Collection. Per the Library, there are no known restrictions on use of these photos, but they do suggest a credit line. On the chance that a photo of your ancestor does exist here, use the Search by Keyword Function. Most pictures of named individuals are well-known soldiers (Grant, Lee) or members of the Officer Corps. While neither Keller nor Knox were pictured, I did find 100 infantry photos as well as dozens of images of the major battles. One of them was this picture of a Signal Tower overlooking the Antietam battlefield. 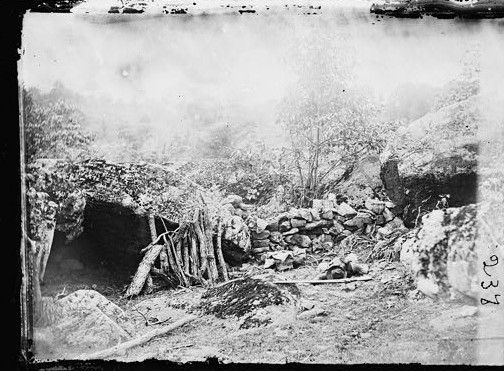 Another of a Confederate sharpshooter hideout at Gettysburg. Library of Congress, Prints & Photographs Division. 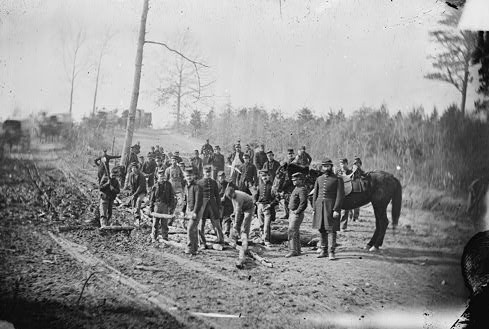 If you can't find a battle image, look for photos of soldiers in your ancestor's branch of service, like this one of engineers building a "corduroy road" (sand-covered logs placed over a low or swampy area). Engineers are especially remembered for the pontoon bridges they built across the Rappahannock River in support of the 1862 attack on Fredericksburg. A second great collection at American Memory is Civil War Treasures of the New York Historical Society. Copyright issues are clearly stated for this collection, including "The New-York Historical Society is not aware of any U.S. copyright or any other restrictions in the materials in this collection, claiming only physical ownership." If you want to publish any of these photos or use them commercially, you'll need to get permission from the Society. Again, you can search for your ancestor by name, his battles, regiment, or branch of service. 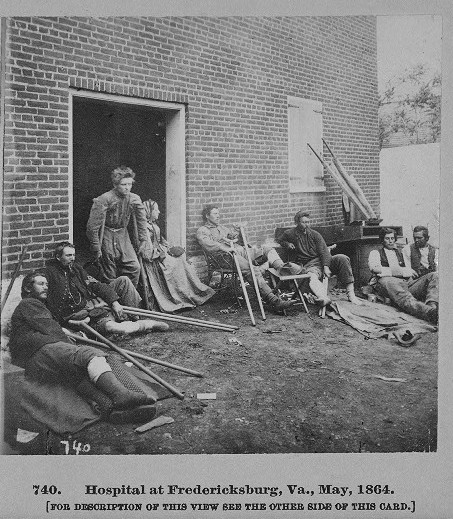 Among the finds here is this photo of the "hospital" at Fredericksburg. Want to get a sense of how desperate the Army was to fill its ranks? 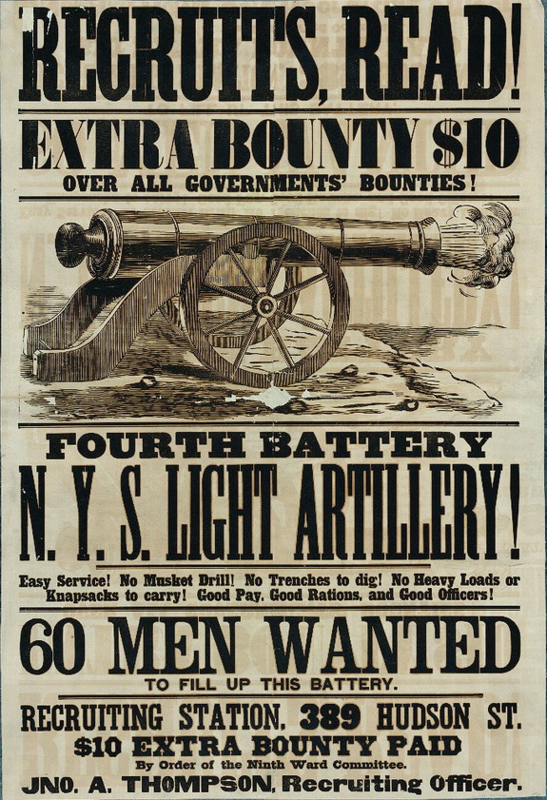 This collection includes several recruiting posters, like this one for the 4th Battery, New York State Light Artillery. Note the promise that the recruit won't have to dig ditches, drill or carry heavy loads! While you won't find photos of your ancestor in this collection, it is possible to find images of buildings that became part of battlefields. Although some of the pictures weren't taken until the 1920s, you will find some of buildings that no longer exist. The site isn't organized by battle, so use the on-site search engine. For example, a search for "Gettysburg" found images under Prisons, Medical, Railroad and Other. 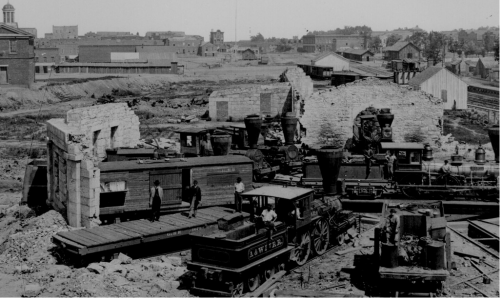 Although most infantry traveled on foot, railroads were used to move supplies and other materiel. So don't forget to check out the Railroad section. If your soldier was involved in the Battle of Atlanta, like James Knox, he might have seen a sight similar to this one of a destroyed engine house in Atlanta. 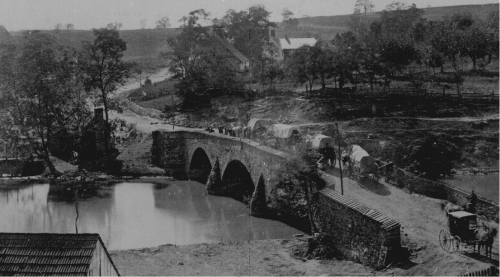 Or, if, like Mike Keller, he was at Antietam, he might easily have crossed this bridge across Antietam Creek. The Gettysburg images include images that open a window onto everyday life in the Army. Here, you'll find photos of dice, checkerboards, playing cards, pipes, enlisted man's tent, diary, and other day-to-day items that would have been seen in an encampment. 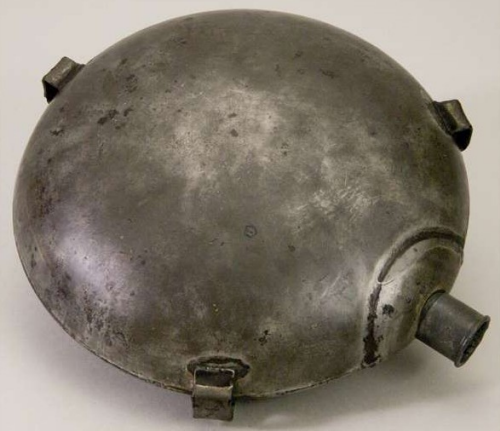 Pictured here is a Civil War canteen. The Battle Flags collection is small but details the importance of a regiment's flag. Capturing an enemy flag was a major coup; General Custer's brother, Tom, received two Congressional Medals of Honor for capturing two battle flags near the close of the war. Arlington House, home to the Robert E. Lee family, was taken over by the Union after the war began. This exhibit features not only images of the interior, but also links to Civil War-era recipes. An interesting look into what your Civil War ancestors might have cooked for supper. The Siege of Vicksburg was considered a major win for the Union because it effectively split the Confederacy in half. The 47-day siege ended on July 4, 1863. It's said that the citizens of Vicksburg didn't celebrate the 4th of July for another 81 years. If your Civil War soldier was actually a sailor, you'll find photos here of life aboard a Union gunboat. 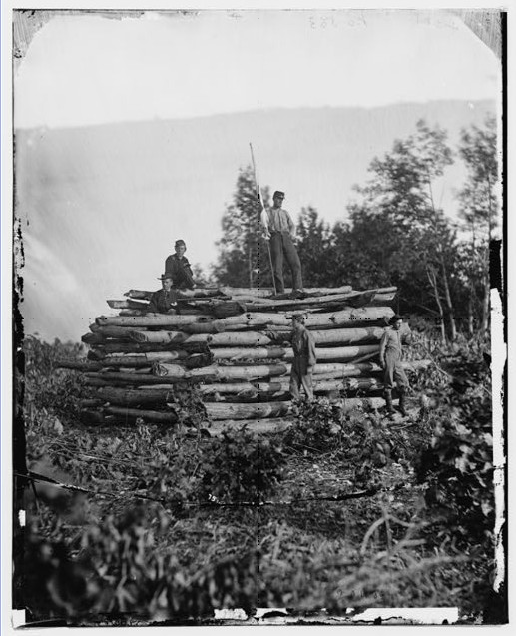 Before you end your Civil War photo search, make one last journey back to the American Memory Collection at the Library of Congress. There, search for the phrase 'Grand Review'. 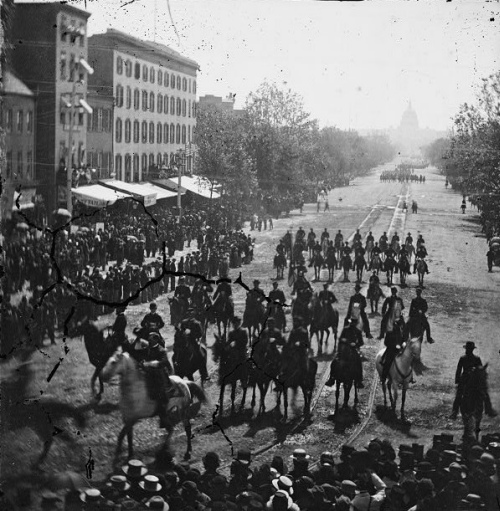 On May 23 and 24, 1865, elements of the Union Army marched through the streets of Washington, D.C., a national celebration of the war's end. With Lincoln assassinated a month earlier, the men were reviewed by the new President, Tennessean Andrew Johnson. Three armies were close enough to Washington to take part in the Grand Review: the Army of the Tennessee, Army of Georgia and Army of the Potomac. On the 23rd, General Gordon Meade led the "bandbox" Army of the Potomac, and on the 24th General Sherman led the men from the West. If your ancestor served in any of the three armies, he would have marched through the streets of Washington and past the reviewing stand in front of the White House. Mike was there and so was James. Surely, a day to remember. Although you'll probably find at least a dozen photos relevant to your ancestor's Civil War service on these five sites, keep up the hunt. State, county and local historical and genealogical societies often have extensive photo collections that aren't online. It's worth a phone call or e-mail to see if your Civil War soldier's photo is among them.